When you gotta down dog, you gotta down dog. 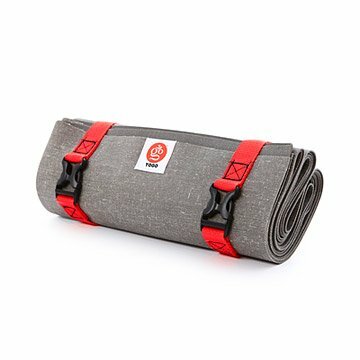 Lightweight and super compact, this yoga mat folds up to the size of a newspaper so you can take your practice wherever your travels take you. It's made from dense, biodegradable tree rubber that offers just enough stick to maintain balance in twisted lunge poses. The compact, folded design also keeps the bottom of the mat from ever touching the top of the mat, so you can keep your practice spot cleaner longer--just give it a quick rinse in the shower and hang to dry. Designed in California. Made in Taiwan. Rinsed in the shower and buckled to the shower bar to air dry thoroughly after each use. It can also be deep-cleaned with a natural castile soap then rinsed and dried thoroughly. Folding up to the size of a newspaper, this lightweight yoga mat lets you take your practice on the go.